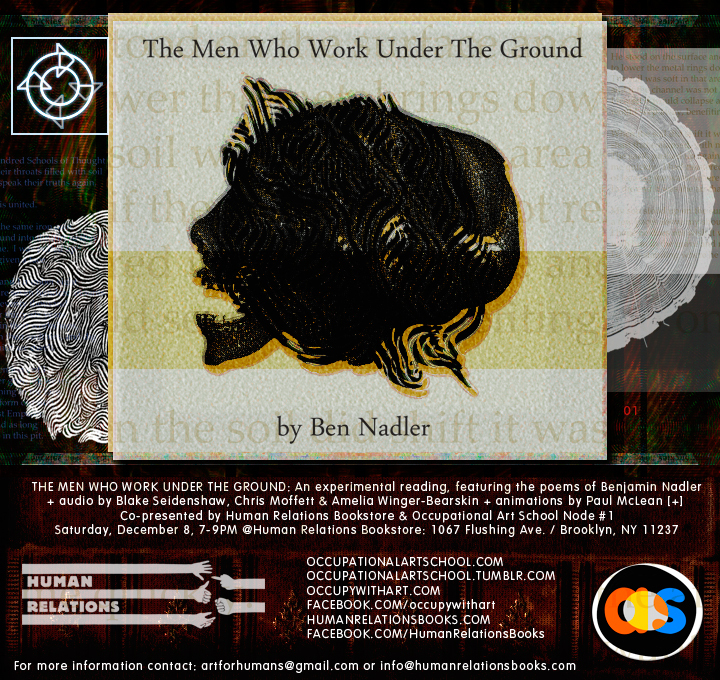 Ben Nadler is the author of the poetry chapbook, The Men Who Work Under The Ground (Keep This Bag Away From Children Press, 2012), and the novel, Harvitz As To War (Iron Diesel Press, 2011). He lives in central Brooklyn, and teaches writing at The City College of New York. He is the grandson of a coal miner. with a foe like that the odds weren’t in my favor. eventually it attacks you back. remembers being coal before it was burned. Human Relations is a joint venture of some hopeful, fresh-faced youth and the jaded, scowling he-crones of Williamsburg’s Book Thug Nation. Our dream is to open a building in Bushwick, Brooklyn with vegetable and flower gardens on the roof, studios of all sorts on another floor (painting, holography, photography, theater, film and all these working together) on another, living spaces and a childcare facility on another and all of these centered on a cooperative economy: food co-op, art and educational co-op, art offered in an alternative economic model. The doors to and in this place will open all ways— out to the community so all are welcome and within the space open to all rooms so people share and work together and create together. There will be teaching in this school, naturally, but no classes. Instruction will be through inspiration and guidance in open apprenticeships. We will practice the spirit of Occupy in the most constructive, joyous, healing way we can. We will step outside of capitalism, not confront or battle it. We will ignore the hegemony of institutions and corporate interests not try to overthrow or fight them. We will work outside of corporate time and within liberated time that flows as it will. Chris Moffett and Blake Seidenshaw collectively assemble, on occasion, as The New Ergonomics (thenewergonomics.com) only to collaborate in turn with other assemblages, reworking the nature of work. Blake is a contributing editor at ecogradients.com, an online journal of interdisciplinary culture and education. A ceramicist and a musician, he is a cofounder of the Ashtanga Yoga Outreach network. Also: interdisciplinary edutecture; the history and practice of philosophy and the natural sciences; and contemporary (cosmo)political (ethno)ecology. Chris engages the imagery, philosophy and architecture of education, the way we image forming and being formed by our environments. Sitting in a chair, or refusing to sit still, becomes a form of art making. A nomad scholar and movement educator, Chris is also a founding member of the artist collective ARE (aestheticrelationalexercises.com). Amelia Winger-Bearskin is an assistant professor of Art and Film at Vanderbilt University in the area of Time Based Media Arts and Performance. She works with ‘models’ (as defined by agent-based computer programming) as a conceptual prompt in her performance work. She has developed a concept of Open Source Performance Art (OSPA) and has spoken about OSPA at various academic conferences and performance festivals since 2010. She performed at the 10th Annual OPEN ART Performance Art festival in Beijing, China, The Performance Art Network PANAsia ’09 in Seoul, South Korea, and the TAMA TUPADA 2010 Media and Performance festival in the Philippines. Winger-Bearskin recently spent a month in Sao Paulo, Brazil performing at the Verbo Performance Art Festival (the first American performance artist to be invited to do so), through an international scholar exchange sponsored by University of Sao Paulo and Vanderbilt University VIO and Art Department. She was an Artist in residence at the University of Tasmania (Australia) school of Visual and Performing arts. Other recent performance credits include the Gwangju Biennial [three events: 1) main pavilion; 2) the Lotte Gallery Media and Performance Festival; and 3) the Women’s Biennial in Seoul, Korea]. Currently, she is presenting a sound installation throughout the Nashville International Airport, and in Fall 2012 will be speaking about her work and OSPA as a visiting artist at universities in Portland, OR; Chicago, IL; and New York City, NY. Paul McLean is an artist accomplished in new media and traditional fine art, a pioneer in dimensional production and integrated exhibit practice. He has exhibited in one-man and collective shows extensively since 1986, and is currently represented by SLAG Contemporary Gallery in Bushwick (Brooklyn, NYC). His research interests include media philosophy, specifically pertaining to time and systems; individual and collective expression; and the convergence of 4D methodologies among military, political, business and social sectors. McLean holds a B.A. in English with a Fine Art concentration from the University of Notre Dame (South Bend, IN), two Masters degrees from Claremont Graduate University (MFA in Digital Media, Masters of Arts & Cultural Management) and is currently a doctoral candidate at the European Graduate School in Saas-Fee, Switzerland. He is a contributing writer for the Brooklyn Rail and other publications and has been blogging since 1999. McLean has been a co-organizer of Occupy with Art since September 2011, and is a founding member of the Occupational Art School Node #1 in Bushwick. He creates moving images for projection, art environments and the web; net.art, web and print graphics; paintings and drawings; poems, commentary fiction and non-fiction. McLean lives and works in Bushwick. The event is free and at an awesome used bookstore. 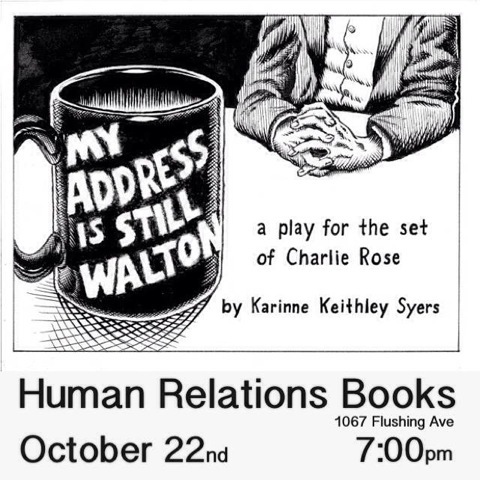 A jug of nearly undrinkable wine, some coffee, and some trash snacks will be served.